WELL. i have to confess to you guys, i'm in a terrible mood. my doctor made me furious today, because the pharmacy lost my prescription... and he refuses to fill it until i come in for an appointment on Thursday! i take the hormone constantly, so i'll have been off my birth control for four days (which does not help my mood to have my hormonies raging!). between him and the pharmacy, i could just spit. has something like that ever happened to you guys? 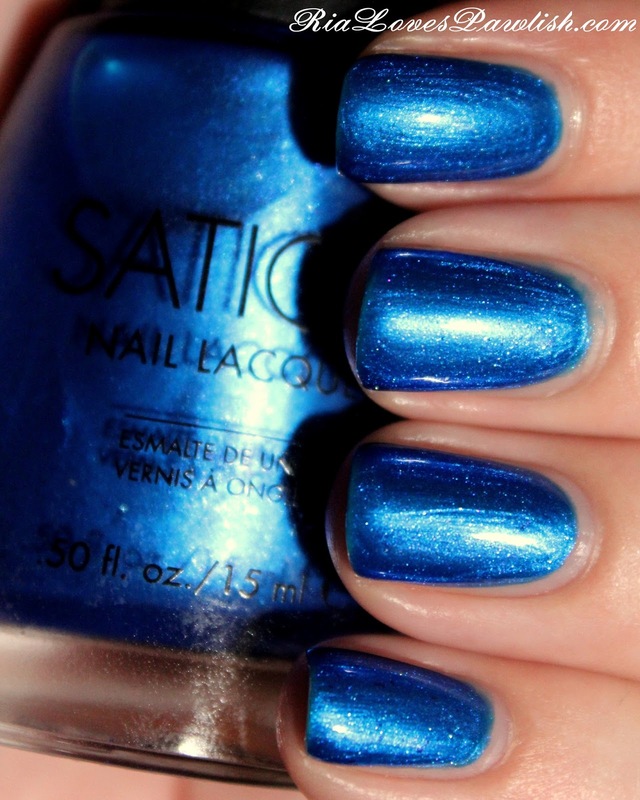 on to much happier things, the polish of the day is Sation Suede Shoes! it's a beautiful (surprise!) blue shimmer with very scattered silver glitter particles. it leans a bit frosty, but the brushstrokes aren't super visible. i was worried the glitters would be lost in the sauce, but you can see them easily :) it looks really sheer on its first coat, but becomes totally opaque on coat two. the color isn't quite as warm as it looks in the picture, the white specks you see are actually the silver particles! two coats Suede Shoes, one coat Seche Vite.